With the establishment of the Florida State College for Women in 1905, women continue to play a vital role in the history of our University. This year marks the 50th anniversary of women’s intercollegiate athletics, and it has given us the opportunity to reflect on our past and hopes for the future for women’s sports and collegiate women in general. Since the Seminole volleyball team played their first game in 1968, FSU has been a national champion in promoting and supporting women’s athletics. Three great supporters—Dr. Billie Jones, Dr. Janet Wells and Dr. Mildred Usher—were instrumental in women’s athletics at FSU beyond the duties of administration, coaching, teaching, mentorship and financial support. These ladies graciously spoke with us about how women’s athletics has changed and provided advice to current and future students and athletes. DR. BILLIE JONES earned her doctorate from FSU in 1972 and is a professor emerita within the department of physical education. She was the head coach of the Lady Seminole volleyball (1970, 1972-75) and softball (1971, 1972-74) programs. DR. JANET WELLS, a former basketball player, earned her bachelor's degree from FSU in 1942 and doctorate in 1952. She is a professor emerita and former chair of the department of physical education at FSU, where she served for 30 years as an administrator. DR. MILDRED USHER served as the first women’s basketball coach for consecutive seasons (1974–1976). She earned her doctorate from the FSU College of Education in 1980. Q: What is your greatest memory from serving as a coach/student-athlete at FSU? JONES: It was 1973 with the volleyball team. We went to Wooster, Ohio for the National Association for Intercollegiate Athletics for Women tournament, finishing top 10 in the country. We got to meet people from different parts of the country, including Billie Jean King, former world No. 1 ranked professional tennis player. It was the highlight of our year. USHER: I’m the type to get goosebumps on a court with an empty gym. Every time I walked on a court, it was thrilling to me. I enjoyed the students and when they succeeded. Q: What is one piece of advice you would give to a female student-athlete who faces adversity today? JONES: Don’t limit your education to the classroom. Dare to do and dare to be. Volunteer, meet different people from all backgrounds and interests. Take advantage of what’s offered on campus. If you don’t, your education is limited otherwise. USHER: Find out the cause of the problem and if it’s important enough to change [your] philosophy, try something new. Bring some satisfaction in what [you’re] trying to accomplish. WELLS: Enjoy your teammates, enjoy the game and play hard. Seek help from teammates and coaches if you need it. I hope they would care about the game, despite the outside pressures. Q: How do you think women’s athletics has changed in the past half-century, and do you think there’s anything still to be done for women in collegiate athletics? JONES: There are fewer female coaches and still fewer opportunities in higher levels of athletics administration with women only representing about 10 percent of NCAA Division I athletic directors. Men are rapidly replacing female coaching staff. However, for female athletes, it’s been wonderful! Their coaches and support staff are well qualified and educated, while the athletes themselves are highly trained and becoming faster and stronger. USHER: The pressure has gotten more intense. [But I think it’s] important to continue providing opportunities for [women] to enjoy the play, movement and physical success. It’s a male phenomenon, but women enjoy the same value in participating in sports. It is a joyful feeling that you get. WELLS: The change has been dramatic because of all of the pressure in collegiate athletics about winning. Now there is more learning support [but with that comes] more pressure and obligation. 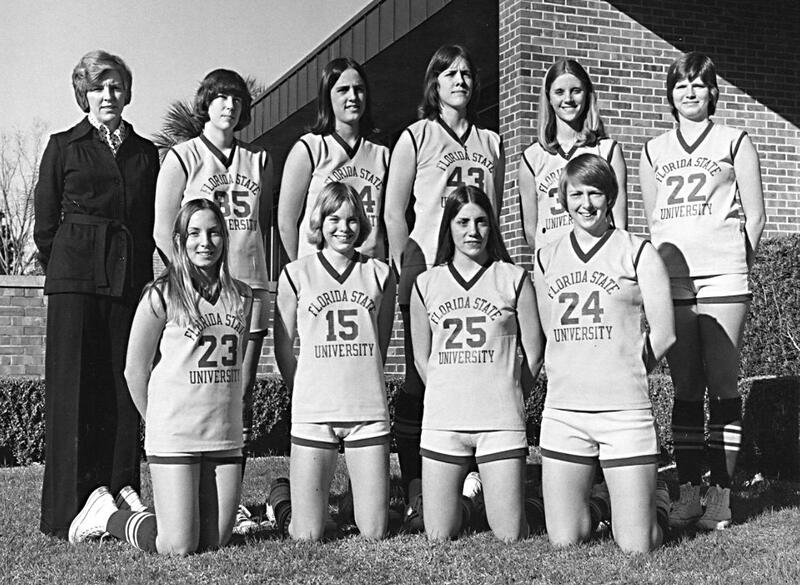 For a detailed timeline of women's athletic accomplishments at Florida State, visit: seminoles.com/50thanniversary. In celebration of the semicentennial anniversary of women’s athletics, W4FSU plans to recognize female student-athletes and coaches as part of its 10th anniversary “Who is W4FSU?” social media campaign. This campaign seeks to promote and highlight all W4FSU has accomplished in a decade and also to celebrate our members. Be sure to like us on Facebook and follow us on Twitter. To honor their significant contributions to the progress of women’s athletics and their lifelong service as mentors to student-athletes, support the Dr. Billie Jones & Dr. Janet Wells Scholarship by visiting: one.fsu.edu/foundation/donate/give-online and specify Fund F02046.